In that other MMO, I have several tailors, including my shadow priest. Thus, it was an obvious choice to make my first SWTOR character, my sorcerer, a Synthweaver. I like to make myself gear, and have found it to be a reasonably lucrative profession choice from an auction house resale standpoint. As a Synthweaver, you will want to have Archaeology as your gathering profession so you can pick up crystals and artifacts as you explore the world on your missions. For your mission skill, if you want to be able to have easy access to the materials for making blue quality or better gear, which I always do, you will want to level Underworld Trading. Note that many folks wait to level Underworld Trading until they hit max level then parcel out their 5 companions on a never ending marathon of missions until they hit 400. This is perfectly acceptable though not the route I choose. If you have a ton of cheap Underworld Trading goods in your Galactic Trade Network, you may decide to pursue Slicing or Diplomacy as your Mission skill instead, depending upon your game goals. Critical versions of a green item have +Crit as a third stat. Overkill versions of a green item have +Power as a third stat. Redoubt versions of a green item have +Defense as a third stat. I’ve found that re-engineering is your best return on investment for your leveling synthweaving green items. I haven’t found that green gear, regardless of level, has been successful in GTN sales. Now, once you start having the materials to craft rare quality leveling gear, that’s a different story. You have two options with your blue gear crafting: sell the pieces occasionally on the GTN to help offset your Underworld Trading leveling costs, or re-engineer those pieces in the hopes of learning a purple quality version of the pattern. I personally did not start re-engineering blue quality items much until I started making level 40+ gear, but see plenty of the lower level purple pieces in the GTN. The long and the short of it is: you want to make whichever pattern will net you the most skill for the lowest cost. Yes, make yourself some pieces to wear as well, but to efficiently get your Synthweaving up to 400, you will want to be selecting your recipes carefully. On the left side of your recipe name, you will see a number that denotes how many of an item you can make with the supplies you have in your inventory and in your cargo hold. If you look more closely, you will notice that number has a color: Orange, yellow, green or gray. Gray recipes do not provide any skill points. 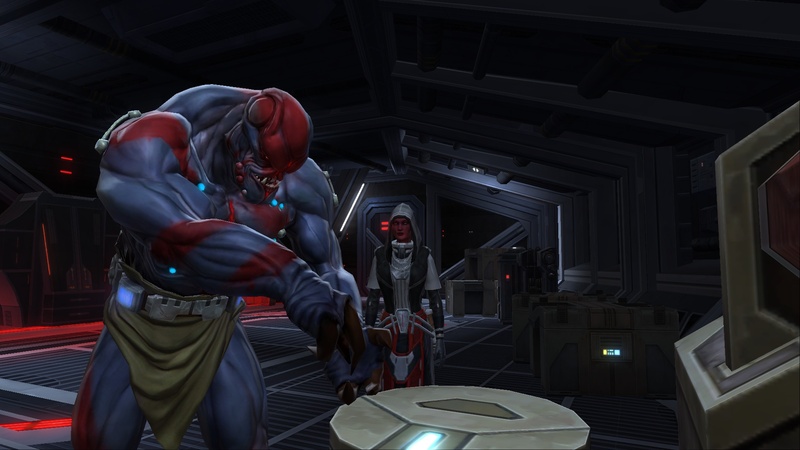 I find this small detail is what most folks miss when starting out with professions in SWTOR, and thus end up crafting recipes that have gone gray, peeved that they are no longer receiving skill points. Also note that every 20 skill points you can go back to your trainer and learn some new patterns. Make sure you do this every time you hit a multiple of 20 to ensure you have orange quality recipes available to you. That’s right, I’m not going to take you all the way up to 400 with this guide because I’ve found that even when leveling two characters’ synthweaving simultaneously, 140-160 is where their paths diverge. This is due to the difference in availability of materials from server-to-server, and the difference in RNG as to what blue quality recipes they’ve learned, and what orange moddable gear recipes they’ve managed to scrape up. 1-20: Savant Sash. 2 Rubat Crystals. 21-40: Savant Gloves. 4 Rubat Crystals. 41-80: Acolyte Bracers. 2 Rubat Crystals. Keep making these until the pattern goes green After 60, will only result in 1 point each but since the other patterns require additional materials, it’s still your cheapest bet. 81-100: Rugged War Waistcord or Reinforced Fiber Belt. 2 Lost Archaeology Fragments, 2 Fibrous Nylite Solution, 2 Eralam Crystals. 101-120: Rugged War Gloves or Reinforced Fiber Handgear. 2 Sacred Artifact Fragments, 2 Fibrous Nylite Solution, 4 Eralam Crystals. 121-140: Reinforced Fiber Boots or Rugged War Boots. 2 Thermoionic Gel Suspension, 4 Nextor Crystals, 2 Sacred Artifact Fragments. 141-160: You’ll choose Acolyte Lower Robe or Acolyte Vestments if you have bountiful artifact fragments and fewer crystals, or Reinforced Fiber Chestguard or either legging recipe you’ve just learned if you have more crystals. 161 onward: Make whichever of the recipes you’ve just learned that you want to focus on RE’ing into a blue for you or your companion to wear. Note that throughout this process, for maximum efficiency and lowest cost, you’ll want to be picking up materials as you complete missions, and occasionally send your companions out on an archaeology mission to grab a hard to obtain/expensive item, such as those pesky Sacred Archaeology Fragments. Although RE’ing your greens will yield a few materials, it will have to be augmented with a flow of materials from your gathering or the GTN.